Every year, the plains of East Africa provide the stage for one of the natural world's most impressive spectacles. Great herds of wildebeest, zebra and other antelope gather in their hundreds of thousands, to travel together across Tanzania and Kenya in search of good grazing and safe places to breed and give birth. 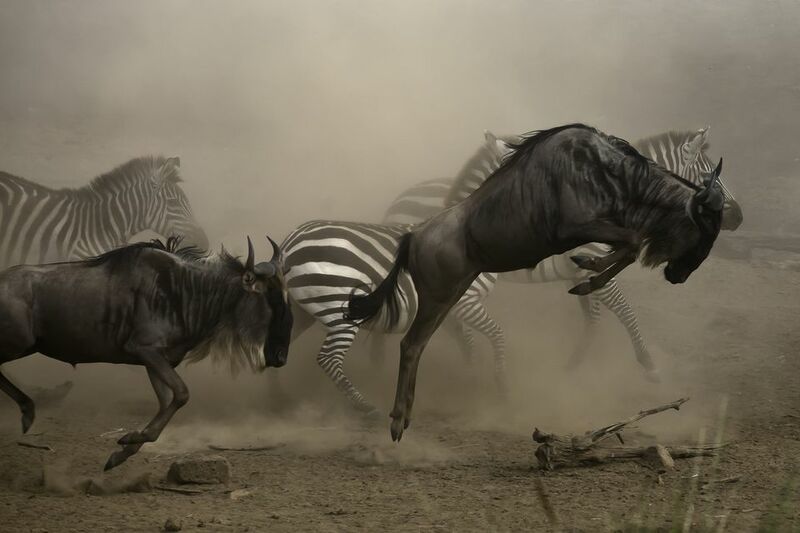 The timing of this Great Migration is dictated by the rains, but some of the best places to witness it in action include the Maasai Mara National Reserve and the Serengeti National Park. A few years ago, I was fortunate enough to experience the Great Migration for myself, when I caught up with the herds as they made their way across the central Serengeti. It was an awe-inspiring sight, with the plains transformed as far as the eye could see into a living sea. Although this amazing event is often referred to as the Wildebeest Migration, in this case, the hirsute antelope were far outnumbered by braying, neighing zebra. Counting them was impossible - I just knew that I had never before seen such an incredible concentration of wildlife. As a lioness came within touching distance of our 4X4, the sea of zebra parted in panic, in a single fluid motion that underlined the impression I had of them merging into a single entity. The lioness, overwhelmed by their sheer numbers and the presence of several other safari cars, soon gave up. Peace was restored, and the zebra re-assumed their previously casual air, some supporting their heavy heads on each others' backs. In between the mass of stripy bodies, the wildebeest grazed on happily. The sight of the two species intermingling so naturally stuck in my mind, and the next day, our exceptionally knowledgeable guide Sarumbo shed some light on the situation. He stopped the Land Cruiser to watch as hundreds of zebra and wildebeest galloped across the road in front of us, and asked whether we knew why the two animals chose to migrate together. Eager to learn, we settled back into the safari vehicle, grabbed a bottle of water and settled in for the next of Sarumbo's fascinating wildlife lessons. Sarumbo told us that the two species travel together not because they're necessarily best mates, but because each has a set of adaptations that perfectly complement those of the other. Wildebeest, for example, graze predominantly on short grass, their mouths shaped to allow them to grip the juicy shoots. Zebra, on the other hand, have long front teeth designed to shear long grass. In this way, zebra act as lawnmowers preparing the ground for the wildebeest, and the two are never in competition for food. According to Sarumbo (an expert speaking from many years of first-hand experience), wildebeest also travel alongside zebra to make the most of the latter species' superior intelligence. Zebra, it seems, have better memories and are able to recall last year's migration routes, remembering hazardous places and areas of safety in equal detail. This is especially useful when the herds have to cross the mighty Mara and Grumeti Rivers. Whereas wildebeest jump blindly and hope for the best, the zebra is better at detecting crocodiles and therefore evading predation. On the other hand, wildebeest are natural water diviners. Their physiology requires them to drink at least every other day, and this need is the basis for an incredibly well-developed sense of smell that allows them to detect water even when the savannah seems dry. When I was there, the Serengeti was very arid considering how recently the rains had fallen, and as such, it was easy to see why this talent might be invaluable to the wildebeests' zebra friends. Ultimately, the two species are also brought together by shared needs and circumstances. Both live in great numbers on East Africa's vast plains, where dramatic wet and dry seasons cause a bounty of grass at sometimes, and a dearth of good grazing at others. In order to survive, both the zebra and the wildebeest must migrate to find food. It is beneficial to travel together, not only for the reasons listed above but because sheer numbers are their greatest defense against the migration's many predators. This article was updated and re-written in part by Jessica Macdonald.